Q: Why do people have trouble reading attachments to my E-mail messages? A: E-mail was designed to send and receive text messages. Not multi-colored text messages with multiple fonts. Not messages with photos embedded in them. Not E-mail with sounds or video. Just plain, simple, unadorned text. Any time you go beyond basic text, you run a risk that the recipient will have problems reading what you send. Two basic rules will help. First, every E-mail attachment must have an extension. JPEG-compressed photos must end in .jpg; QuickTime clips must end in .mov, and Microsoft Word documents must end in .doc. Second, to be on the safe side, you should not send more than one attachment per E-mail message, as many E-mail clients can’t reasonably handle more than one at a time. Q: Speaking of extensions, do you know what application can open a file with a .odt extension? and you should be swiftly directed to a Web page that can help out. Q: Are there any ways to see the contents of an attachment if you don’t have the program that created the document? A: There are two great tools for such detective work. If you think an odd attachment might be a graphic file, drop it on top of Preview. Apple’s Preview application is an amazing Swiss Army knife when it comes to graphics; it reads a shocking variety of graphics formats. The other tool is TextWrangler, from Barebones Software. This free text editor will open up and display many attachments, including things it can’t edit. Even if you can't edit the attachment, though, simply opening it may give you enough information to figure out what the file is, or may allow you to copy/paste useful text out of the file. Q: I tried to print a multi-page Web page from my Web browser, but it doesn’t print properly. How come? Q: I had a problem launching applications. A restart cures the problem. What gives? A: This can be caused by problems with the directory structure (launch Disk Utility and use the First Aid tab to Verify Disk), by a lack of memory in your computer, by problems with a lack of free space on your startup drive, or by having too many applications open at once, or some combination of these conditions. but rebuilding the LaunchServices database is fairly drastic. It may also cause even more problems, so check your RAM, free disk drive space, disk integrity, and other, more common and less drastic measures first. Q: I need to create a database for a non-profit that can be used by Macs and PCs. What are my choices? A: FileMaker is probably the best cross-platform full-blown database. Highly graphical and easy to use, it is so well thought of in the Windows world that few realize it started on a Macintosh. which allows you to create Excel-compatible spreadsheets. The spreadsheets can’t be as elaborate as Excel, and work best with simple lists, but you can share the tables with both Macs and Windows users, and limit access to a password-protected group. The Q&A session ended with Kitty’s Koffee Break, to the great delight of the Q&A moderator, who was thirsty. President Bob Jarecke started by asking how many people had downloaded the electronic version of the Pi Journal in early January. A majority said they had, though a significant minority said they were unaware of any such publication, including a member of the Journal production staff. Hmmm. Need to work on that. Bob then announced Clubhouse Saturday, a “members helping members” effort whereby members can stop by, with or without their computers, and get help with their hardware or software questions. Clubhouse Saturday is covered elsewhere in the Journal. Finally, Bob mentioned that Pi elections are coming in May, and asked that folks consider joining the Board. He concluded with an impassioned plea for articles for the Journal. Travis Good, after serving as the main speaker at the January General Meeting, retired to a side room for a “meetup” where members shared iPhone and iPod touch tips and tricks. Photo by Richard Sanderson. Though it had not been released by the time of the meeting, iLife ’09 (iPhoto ’09, iMovie ’09, iWeb ’09, and GarageBand ’09) each sparked considerable interest. iPhoto ’09 adds face recognition and geo-tagging (which it calls “places”) as new ways to organize photos, and allows direct uploading to Facebook and Flickr, in addition to MobileMe. iMovie ’09 appears to be an interesting melding of the old, beloved iMovie ’06 and the more controversial iMovie ’08, with the best of each, combined with some new tricks such as software video stabilization. GarageBand ’09 adds video-based lessons in how to play various instruments, some of them free and some available for download. iWeb ’09 adds explicit support, via FTP, of sites not on Apple’s MobileMe service, allowing you to upload pretty much anywhere, and also adds support for FaceBook. Little mention was made of iDVD, but it is still included. Apple’s office suite, iWork ’09, was released at the show, and already has a large following. Pages ’09 now offers a full-screen view, dynamic outlines, mail merge, and the ability to work with the very popular EndNote and MathType packages. Numbers ’09 has an innovative method for creating and tracking formulas, adds new table functions, and adds even more very slick charting functions. Keynote ’09 has a clever “magic move” feature that allows objects to change size and orientation as one slide transitions into another. If you have an iPhone or iPod touch, Keynote now allows you to use it as a remote control for the presentation. iLife ’09 and iWork ’09 are available as single-computer packages or family packs, allowing you to install them on up to five computers. Or you can get iLife ’09, iWork ’09 and Mac OS X 10.5 packaged in one box, called the Mac Box Set, at $169 for a single computer or $229 for five machines. This is a great bargain, as five copies of Mac OS X 10.5, five copies of iLife ’09 and five copies of iWork ’09 would otherwise cost $1,435. The big non-surprise was the introduction of a new, widely rumored 17-inch MacBook Pro. Built with the same impressive unibody construction as recently released MacBook and MacBook Pro 15” models, the new laptop has three USB 2.1 ports, a mini DisplayPort for video, a FireWire 800 port, digital audio in and out, an ExpressCard slot, a gigabit Ethernet port, Apple’s clever Magsafe power adapter, a spiffy video card to drive the massive display, and Apple’s new “glass” buttonless trackpad. RAM can be upgraded to 8 GB; a 320 GB hard drive is standard, or you can select a 256 GB solid-state drive. The 2.93 GHz model with 8 GB of RAM, a 256 GB solid state drive, an extra-cost anti-glare screen, and AppleCare will set you back $5,598; the more modest basic model is $2,799. Also making headlines was Apple’s transition to DMA-free (Digital Rights Management-free) music on the iTunes Store, and variable pricing. In the past, all music tracks were $.99; starting in March, after intense pressure from music publishers, pricing will range from $0.69 to $1.29 per track. Apple also opened up music preview and purchase over the 3G cellular network for iPhone 3G users, removing the requirement that music be purchased with a computer or over a WiFi network. In addition to Apple’s offerings, Travis was also intrigued with the Axiotron Modbook. Have a MacBook handy? Give it to Axiotron along with $2,249 and they will convert the MacBook into a tablet computer. No mouse, no cables, and no keyboard: you directly interact with the Modbook via an embedded Wacom drawing tablet. If you insist on being old fashioned, you can pair the Modbook with a wireless Bluetooth mouse and keyboard. Also intriguing was the iBox UPS, a compact, stylish uninterruptible power supply that is supposed to be more eco-friendly than most such devices. Not yet released but also intriguing was the Ecamm BT-1, a wireless Web camera that connects via Bluetooth, allowing the camera to work up to 30 feet from the computer. It is supposed to record 640 x 480 pixel movies and stereo sound, and recharges its battery via your Mac’s USB port. When released, it will be priced at $150. Hewlett-Packard, once a big Mac peripheral manufacturer, has mostly faded from view with the exception of inkjet and laser printers. This year, they were back with an unusual entry: the HP MediaSmart Server. Designed as a home server, it is designed to store photos, music, video, and files, and share them with any computer in the home, Mac or Windows. It can also be used as a backup drive for Time Machine. Another unusual device is the Shure X2u. This doesn’t do anything on its own; it is an adapter that allows you to connect a standard XLR microphone to the USB port on your Mac. Various dials control gain, headphone volume and monitor mix, and a tricolor LED blinks different colors to indicate overloading. If you find cheap USB microphones inadequate and would rather use a more conventional microphone, you need to check out the Shure X2u. AmpLi-Phone is the opposite of the high-tech Shure adapter. The AmpLi-Phone is essentially a passive acoustic amplifier for an iPhone or iPhone 3G. It uses no power, but manages to get impressive sound out of the iPhone’s tiny speaker. Unlike almost everything else on the planet, it was designed and built in California. It sells for $29.95. The Pulse Smartpen is a ballpoint pen that allows you to record sound and synchronize the sound with written notes. If you have a Mac, talk to yourself, and write things down with a pen, technology can now help you out. SlingPlayer, not yet released, allow you to access your Slingbox from your iPhone or iPod touch. If the idea of watching your 52” home TV from out in the wilds or while at work on a 3.5” screen doesn’t fill you with horror, do note that you must have a Slingbox at home for this to work. Other intriguing items introduced included: the iSnipe, an application you run on an iPod touch attached to a sniper rifle to calculate ballistics; iDive 300, a waterproof case and speakers for underwater movie watching on your iPod touch or iPhone; Nekfit, an iPod Nano and Shuffle carrying system that nestles the iPod at the back of your neck; PARASYNC, a cradle that can sync up to 15 iPods at once to a single iTunes library; U-Charge, a device that recharges a backup laptop battery directly, without the laptop; and WebEx Meeting Center for iPhone, an application that allows you to join a WebEx meeting via an iPhone. WebEx Meeting Center may well be more horrifying than either SlingPlayer or iSnipe. Three Pi members, Don Wong, Ned Langston, and Robert (Bo) Huttinger, attended this year’s Macworld Expo, and each gave a presentation. Don Wong’s talk focused on the very long, rich cultural traditions of the Macintosh (January 2009 was the 25th anniversary of the Mac), and the splendid sense of shared awe and expectation, dating back to that famous Super Bowl advertisement long ago. In response to a question from Don, we discovered there were three members at the meeting who had also been present at the Pi’s first exposure to the Mac back in 1984. 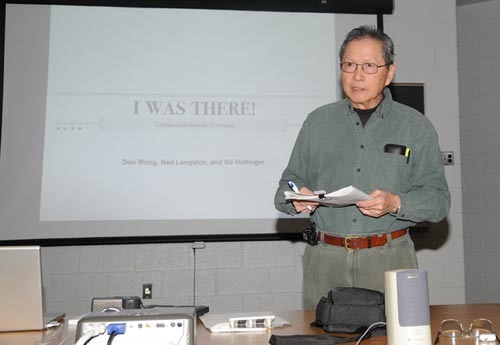 Don Wong shared his impressions of Macworld Expo 2009 and some nostalgic thoughts about the 25 years of Macintosh at the January General Meeting. Photo by Richard Sanderson. Ned Langston offered more of a critique of Macworld, commenting on the size and vitality (smaller, slower, and less frantic this year than past years), the importance of Apple and Steve Jobs to Macworld, and Macworld’s importance to Apple. If Wong’s reminiscence was gently wistful and positive, Langston’s was more critical and cautious. He is concerned that Apple’s withdrawal from Macworld may foretell a less vital, less creative, less vibrant Apple in the future. 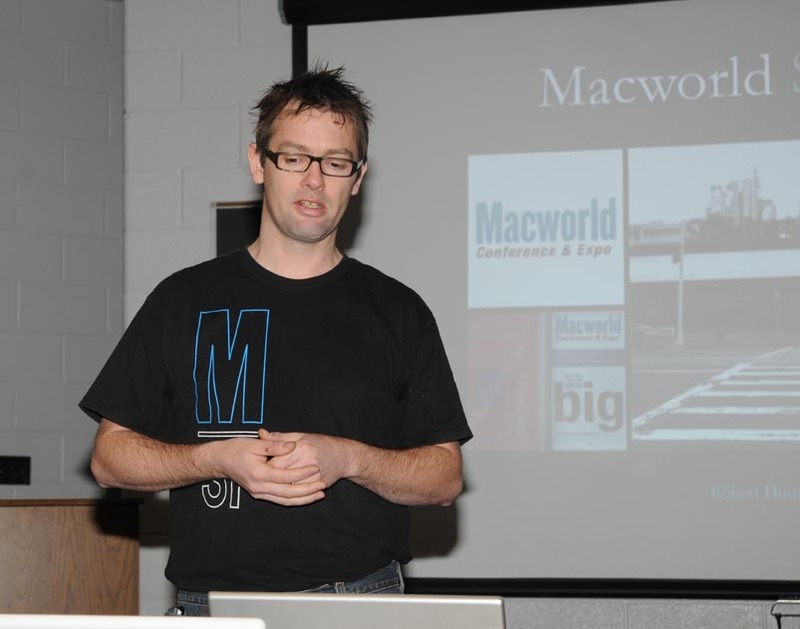 Ned Langston thought Macworld 2009 lacked the spark and sizzle of past expos, and expressed concerns about the future of both Macworld and the Mac community. Photo by Richard Sanderson. Robert Huttinger, a PHP, MySQL and iPhone developer, sketched a much more enthusiastic view, complete with his own Keynote presentation (on the Pi Web site). Huttinger put much less weight on vendor displays and new product introductions, focusing on the often-forgotten conference portion of Macworld. After being banished to an overflow room last year, he showed up very, very early and was 10th in line for the keynote address. He was impressed with Phil Schiller’s demonstration of new products, and did not think Apple suffered for having someone else take over the usual Steve Jobs role. 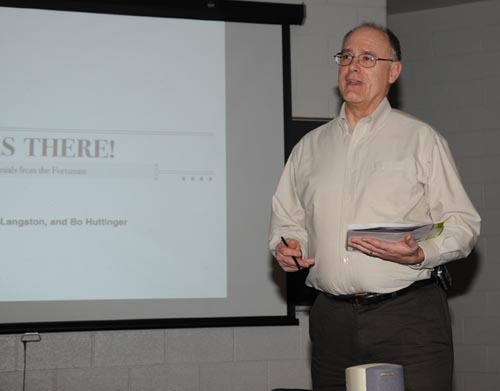 Robert Huttinger offered an exuberant, joyful overview of Macworld at the January General Meeting. He viewed it as a community event rather than a marketing expo . Photo by Richard Sanderson. at the Pi Office sometime soon. Stay tuned for details. The general meeting ended with drawings for prizes. Don Wong came back from Macworld with four respectable goodie bags that were awarded to Jay Castillo, Ross Hatch, Raju Tonapi — our newest member — and Clifton Bailey. The grand prizewinner, of an 8 GB iPod touch, was, again, Ross Hatch. After a pizza lunch, the iLife, Genealogy and novice SIGs met. In addition, Travis Good once again had an iPhone/iPod touch “meetup,” featuring what Travis calls a “parlor trick": he made a phone call from an iPod touch. Not an iPhone, but an iPod touch. Needless to say, the nearly two dozen participants had a blast, and the iPhone/iPod touch “meetup” may become a regular feature. Macworld Expo: What It Means to You! This meeting isn’t going to be your run-of-the-mill MacWorld review but rather a blend of announcements and information, important and otherwise, that might make a difference to you! Come hear about the new, non-Apple products announced, behind-the-scenes intrigue, and developments that didn’t make the news. MacWorld through the eyes of Pi presenters! IMPORTANT NOTICE: We will be sharing the building with a large group of folks and we are asked to enter through the back door, entry point No. 7. 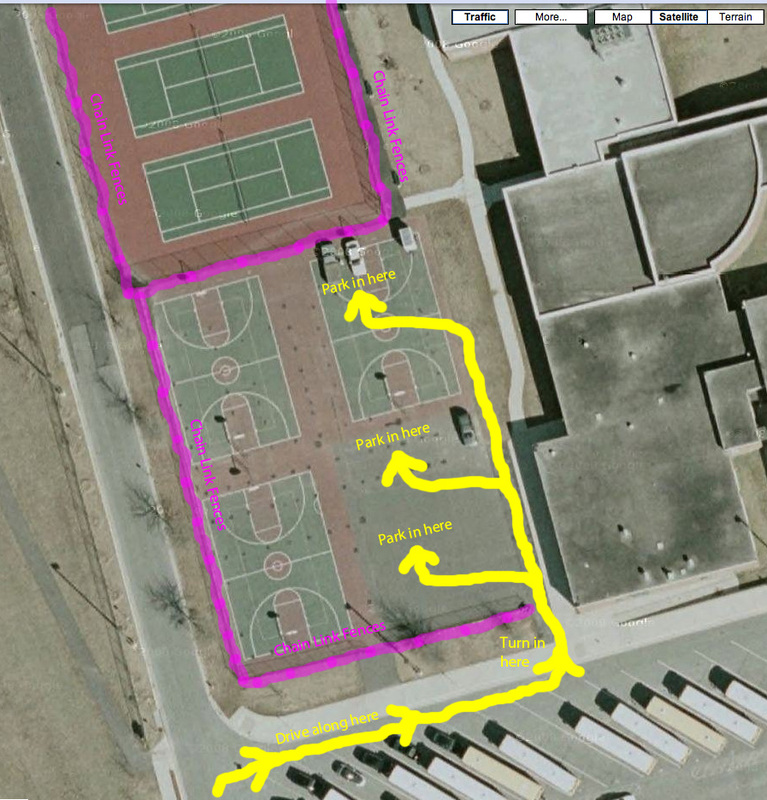 Also, it is requested we park on the outdoor basketball court right next to our back entry location. When you arrive, if you come in off of Gallows Road, come around the north side of the school and go to where the school buses are parked —southwest parking lot. The attached overhead image below will give you a good idea of what to expect when you approach this parking area. Please park as depicted in the image below. 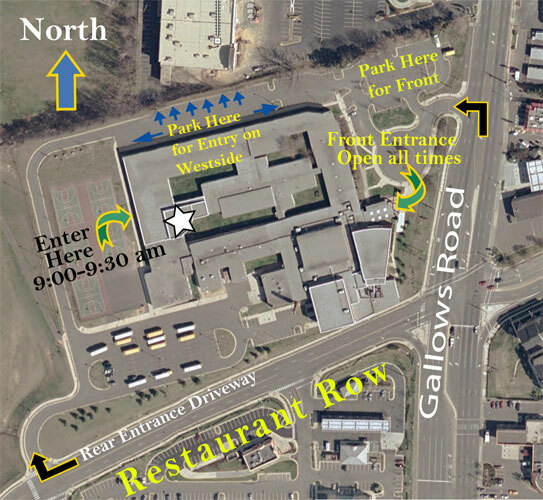 Note: ignore parking directions; use the photo below for driving directions.